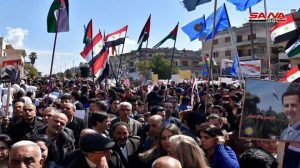 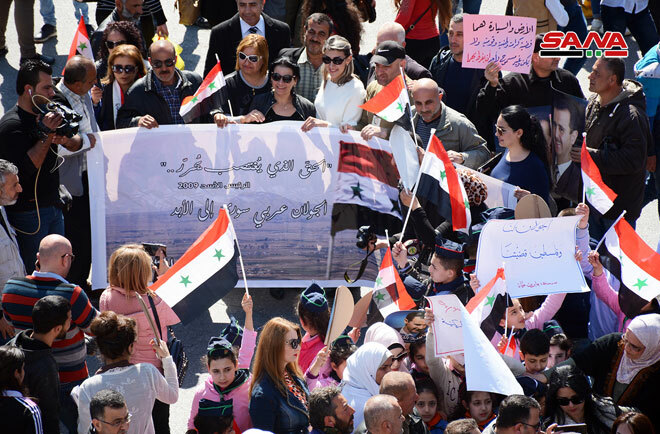 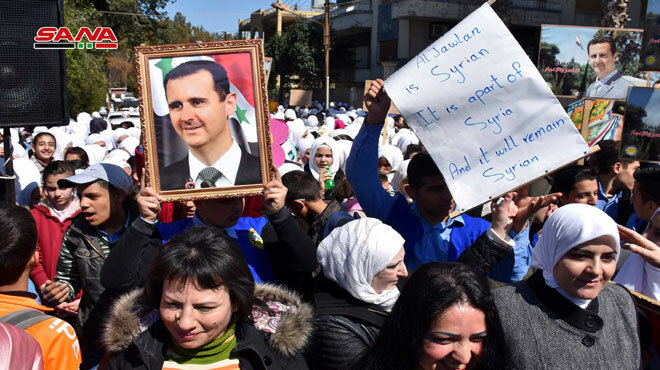 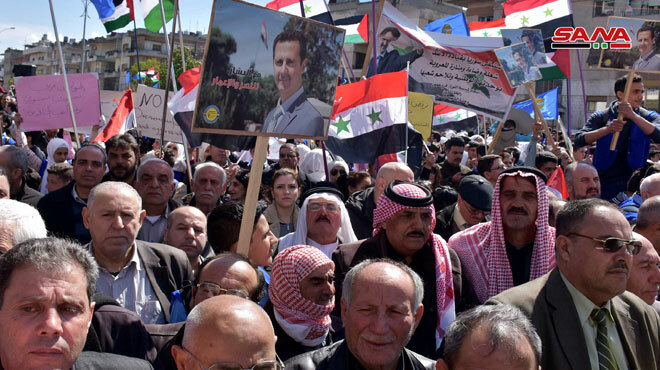 Provinces, SANA- People in different provinces across Syria on Tuesday organized protests against US President Donald Trump’s decision on the occupied Syrian Golan, affirming that it will return to the homeland Syria. 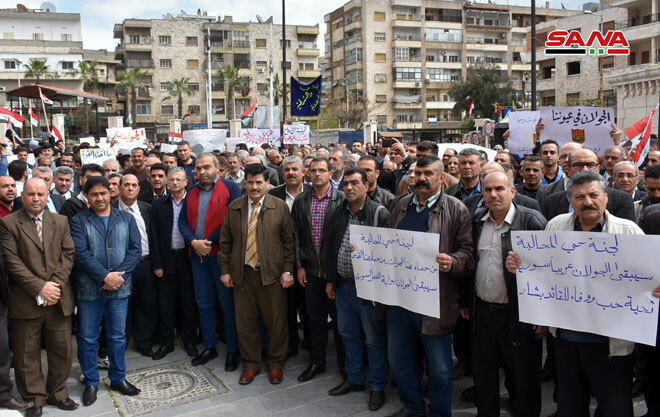 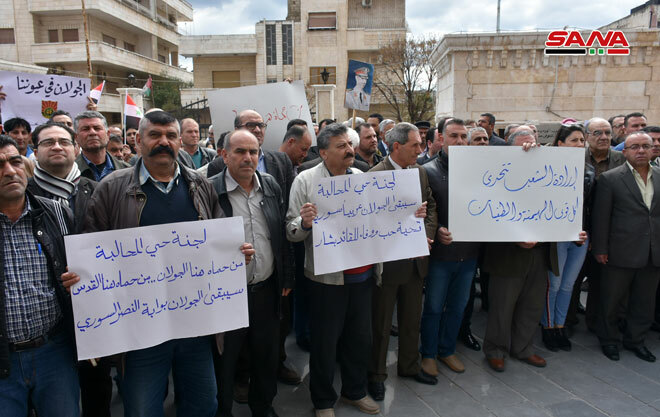 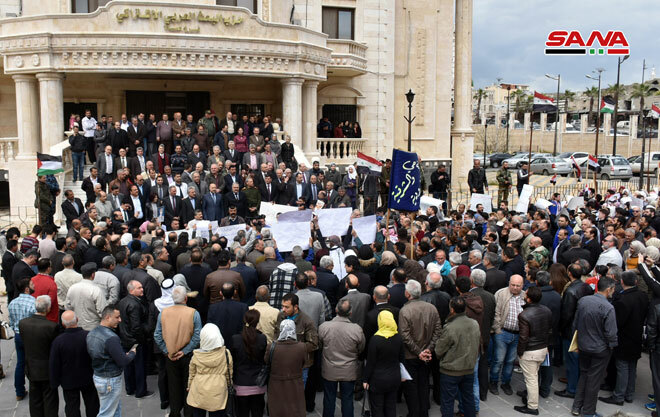 In Sweida, people gathered near the building of the Governorate building in condemnation of Trump’s declaration on the occupied Syrian Golan. 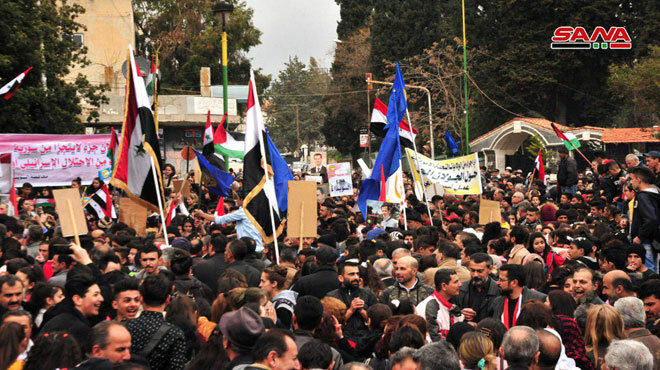 The locals in Sweida raised flags and national banners, expressing in the strongest terms their categorical rejection and condemnation of Trump’s decision. 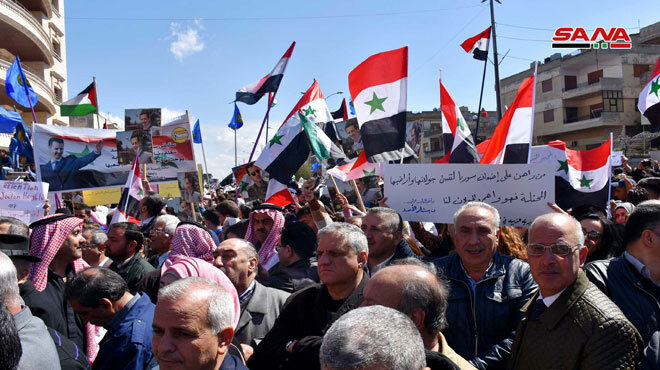 They affirmed that Trump’s decision on the occupied Syrian Golan is null and void and it doesn’t change the fact that the occupied Golan is inseparable part of Syria’s geography and history and that it will return to the homeland no matter how long. 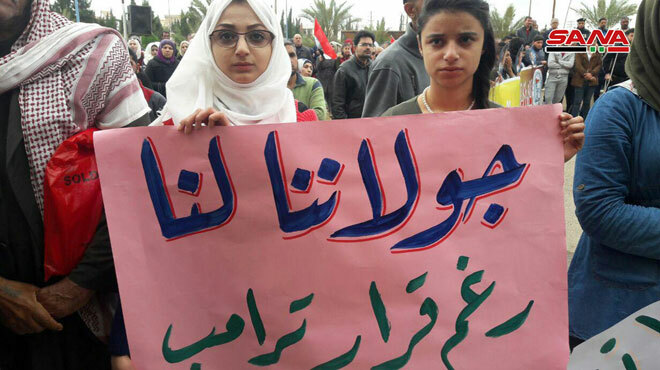 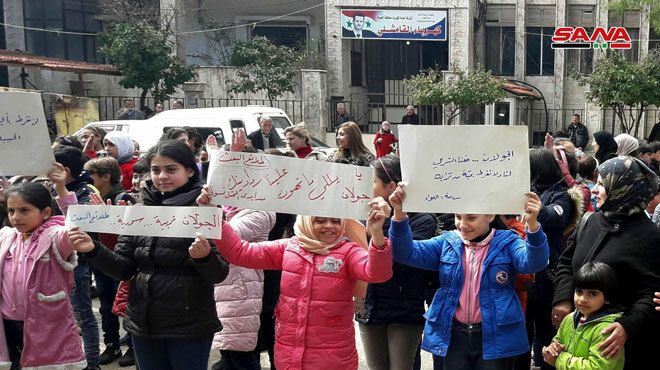 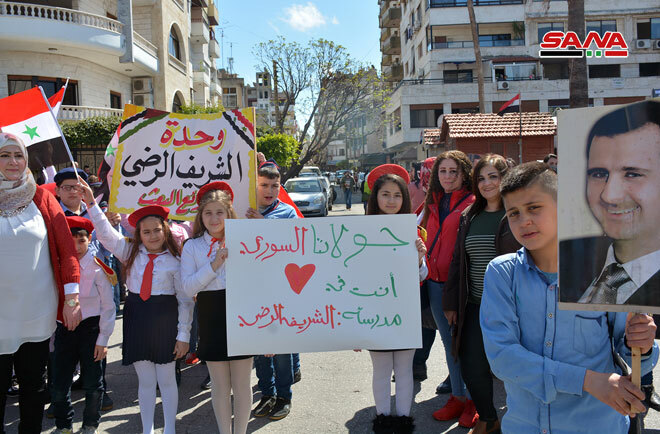 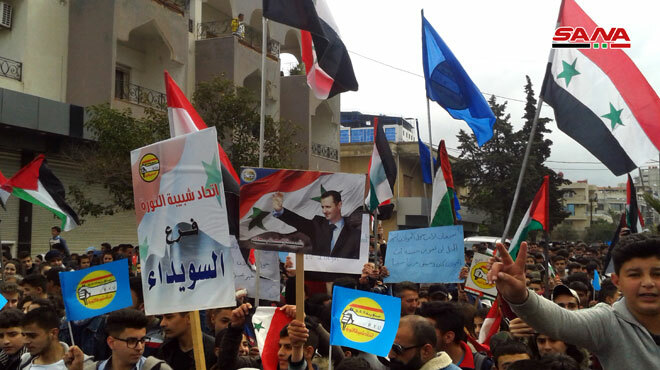 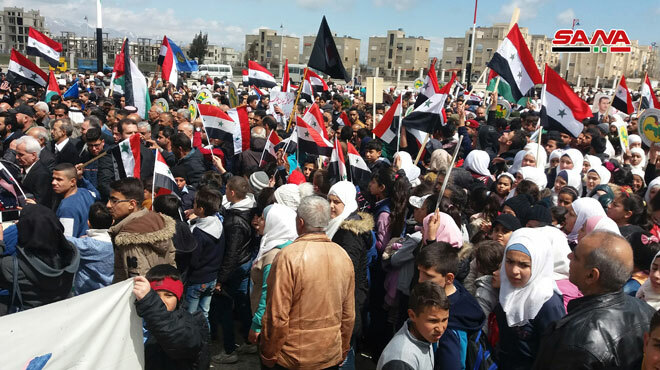 In Daraa province, popular and official activities organized a protest at the Square of al-Baath Arab Socialist Party against Trump’s declaration in the occupied Syrian Golan. 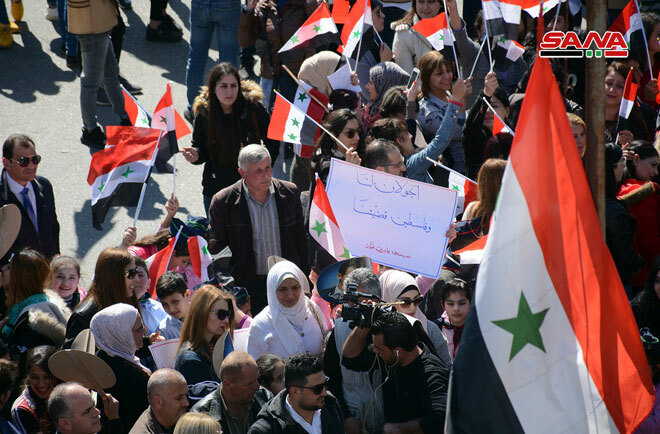 Participants in the stand indicated that Trump’s declaration is part of the conspiracy and the hostile war wage against Syria. 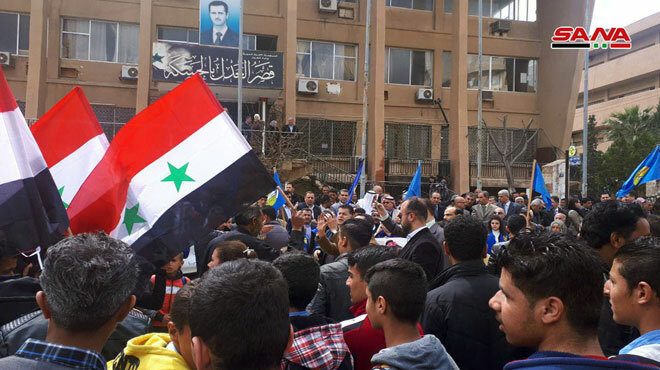 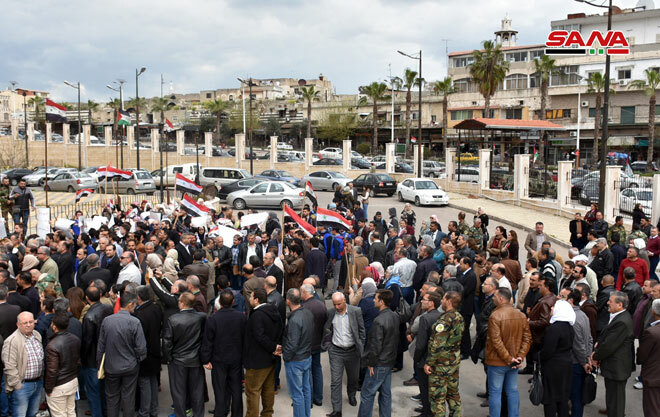 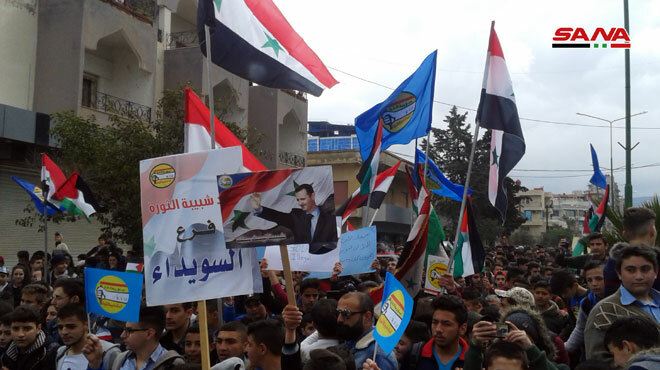 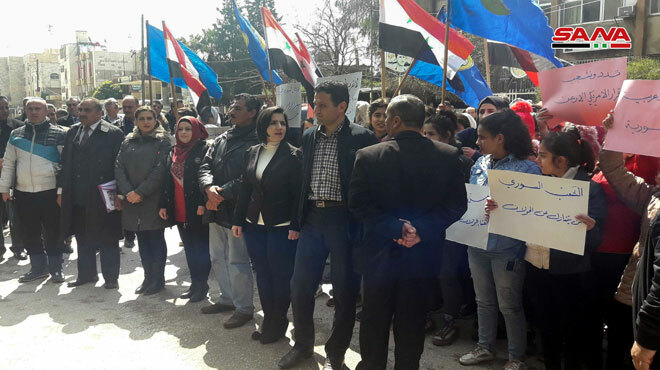 In Quneitra, people gathered in front of the Governorate building in al-Baath City in condemnation of Trump’s declaration on the occupied Syrian Golan and to express solidarity with its people. 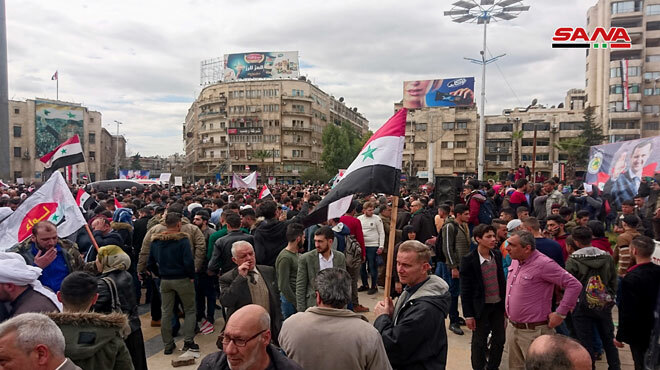 In Homs, intellectual, religious, cultural, and popular movements gathered in front of al-Baath Party main branch in the city to denounce Trump’s declaration. 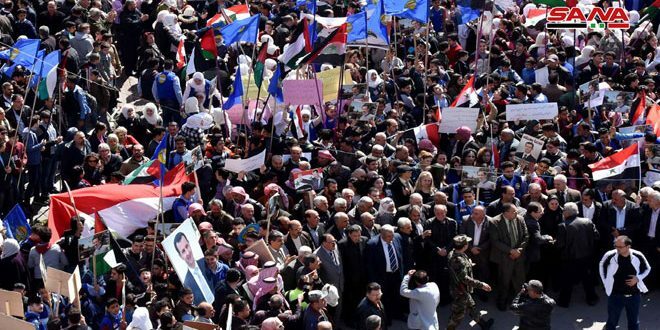 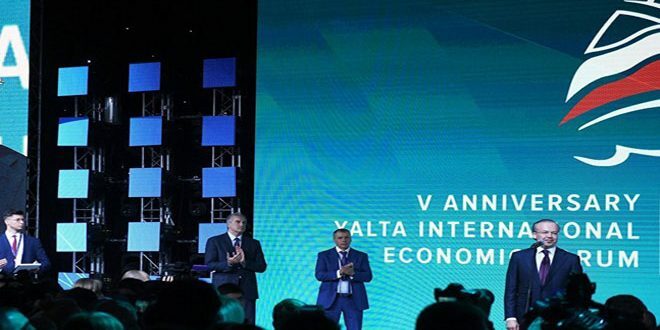 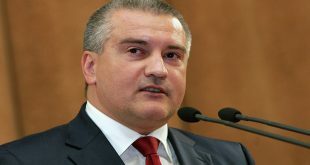 The participants affirmed Syria’s right to reclaim its occupied territories as per international law, and that no country in the world can change the fact that the occupied Golan is Syrian territory. 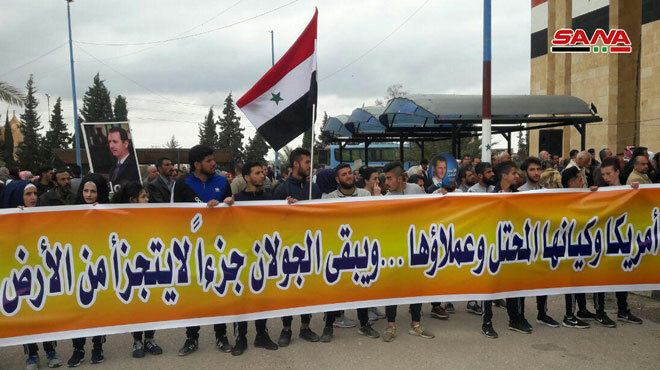 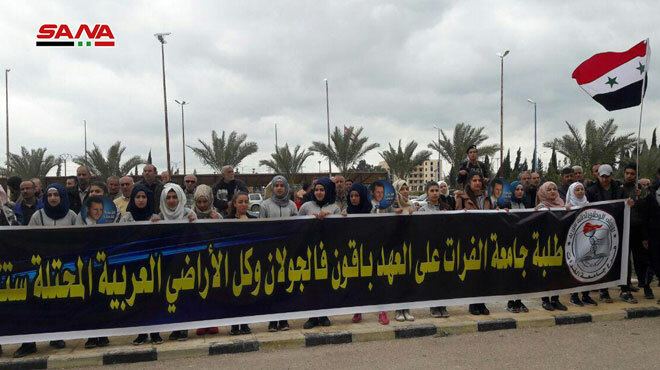 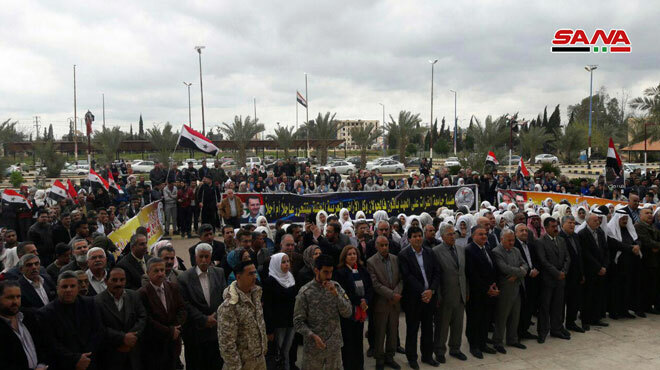 Meanwhile in Hasaka, official and popular activities protested Trump’s declaration, gathering in front of the city’s Justice Palace carrying banners denouncing that declaration, and saluting the people of the occupied Syrian Golan. 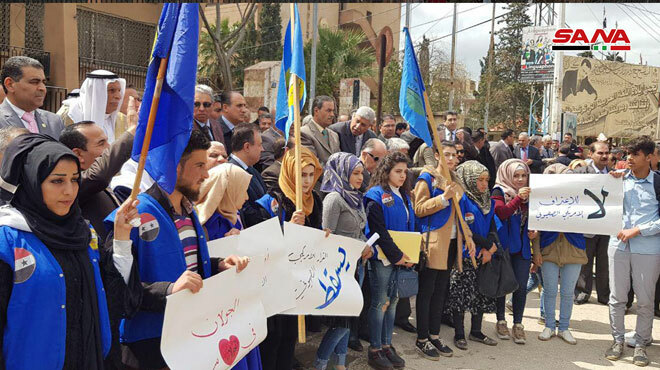 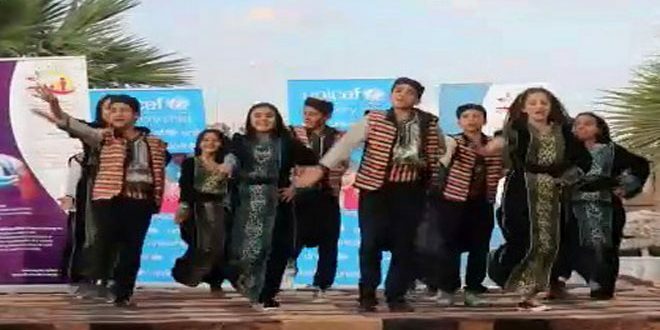 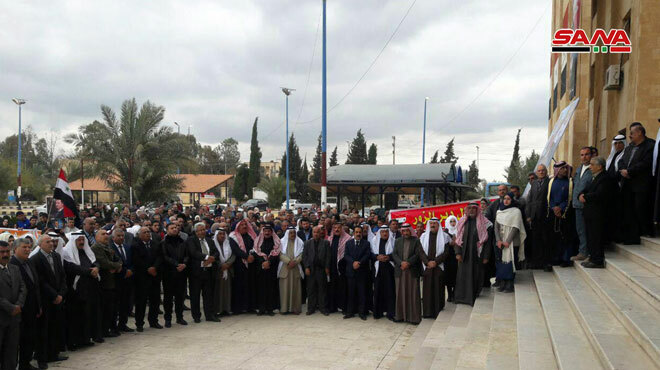 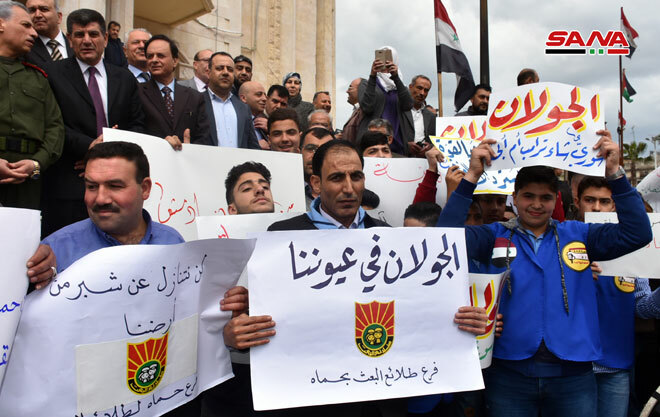 In Qamishli city, social and religious activities gathered in front of the Arab Cultural Center to denounce Trump’s declaration, asserting that it shows America’s bias in favor of the illegitimate Israeli entity. 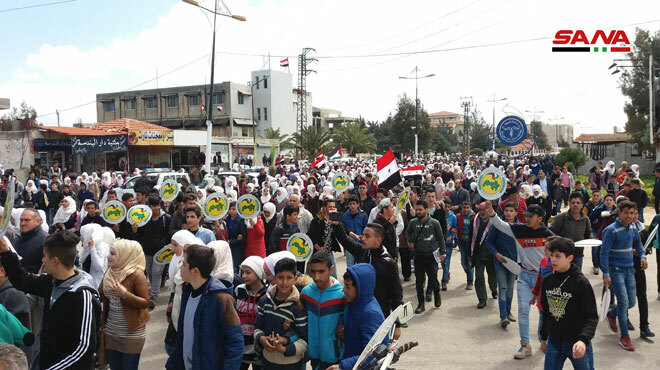 In Hama province, people gathered in Hama city, al-Salamiya city, and al-Seqailibiya area to protest Trump’s declaration, expressing anger at it and asserting that it has no legal value as it contradicts all international accords. 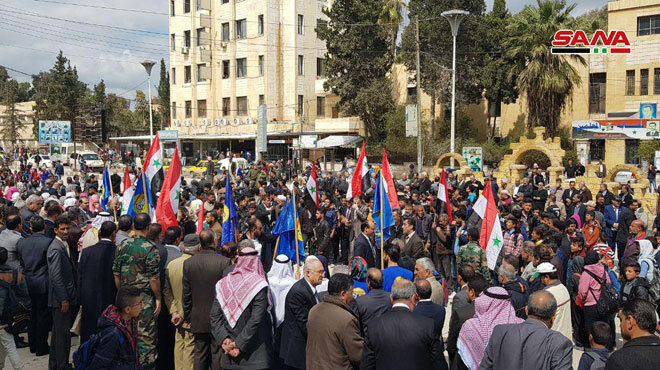 The people of Deir Ezzor province also gathered in front of the Governorate building to denounce’s Trump’s declaration, stressing that it contradicts all international accords. 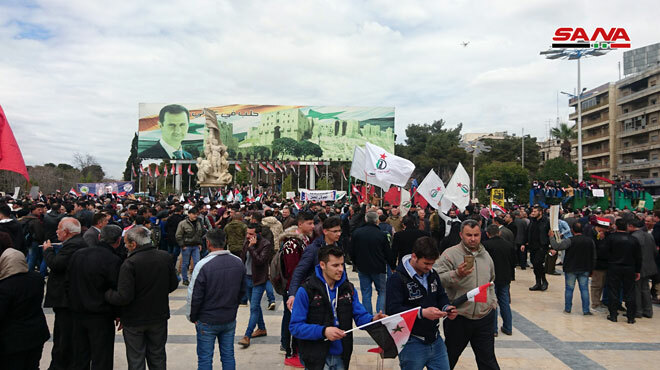 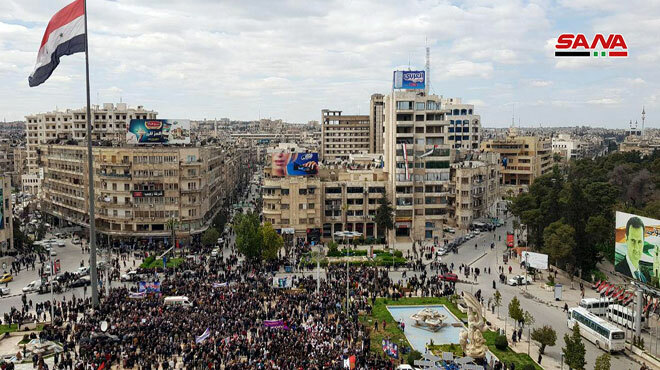 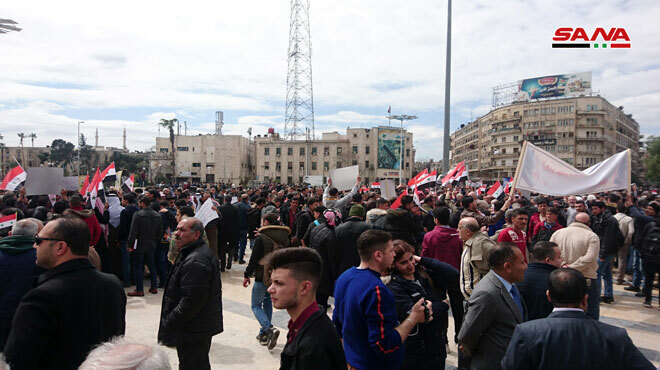 People also gathered at Saadallah al-Jebri square in Aleppo city to denounce Trump’s declaration, asserting that it violates international legitimacy, and that this reckless action will not change the identity of the occupied Syrian Golan.. 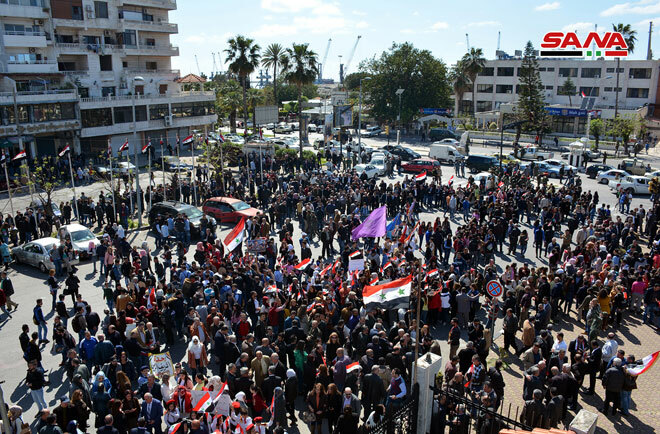 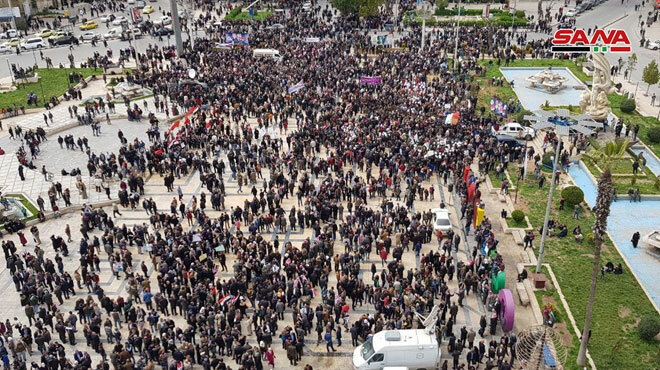 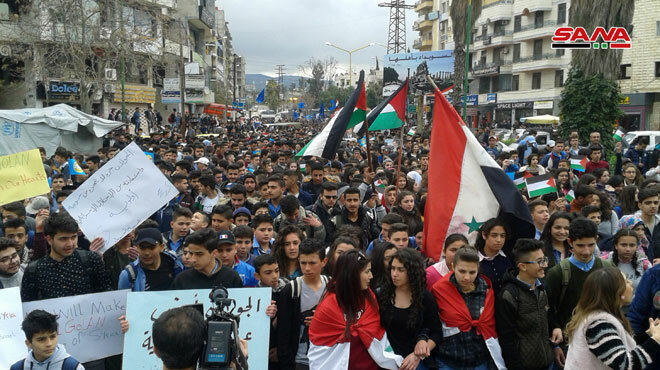 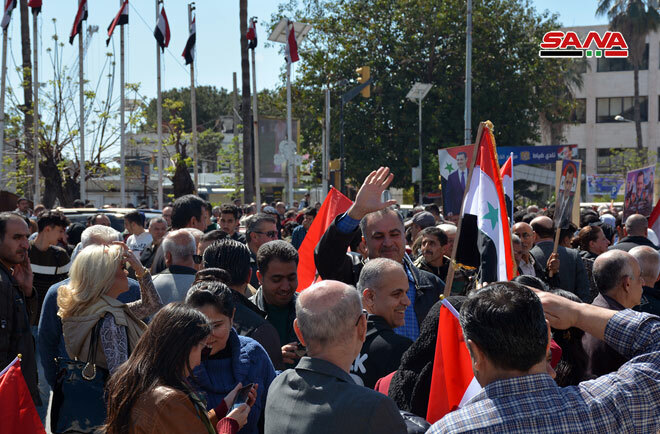 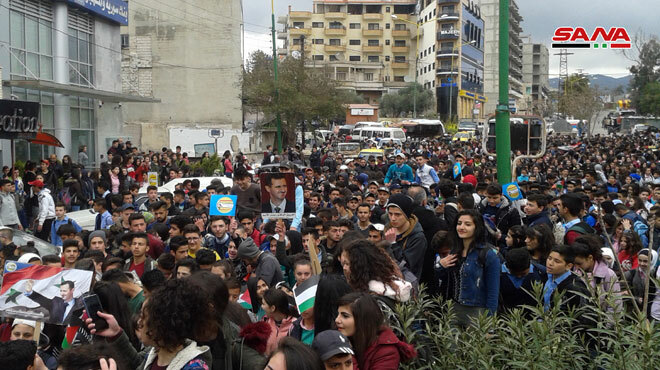 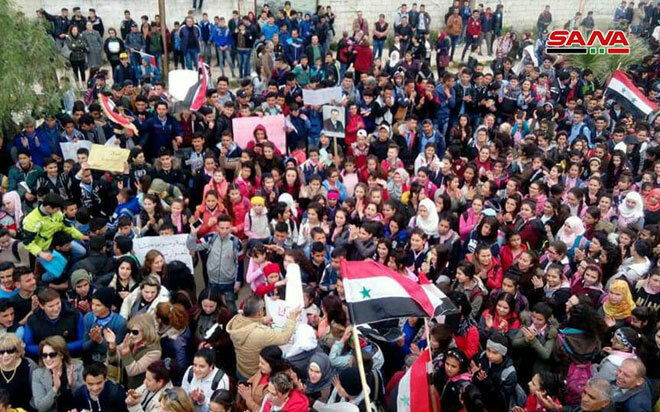 In Lattakia city, people flocked to the Governorate Square to take part in the protests against Trump’s declaration, asserting that this declaration will not change historical and geographic facts, nor will it affect the Syrians’ right to reclaim their occupied lands..